Senior Russian health officials visit Kerala and express a desire to promote the traditional system of medicine in Russian universities and to establish a chair. The Russian Government is eager to work with Kerala to promote yoga and integrate the ancient Indian system of natural medication with the allopathic system. A nine-member delegation from Russia, led by Sergei Kalashnikov, chairman of the Russian parliamentary committee on health, is in the southern Indian state to explore various avenues of cooperation. The delegation met Kerala Chief Minister Oommen Chandy and expressed their intention to popularise Ayurveda in Russia and the Commonwealth of Independent States countries, the Hindu said. The delegation conveyed their intention to recommend Ayurveda treatment in Russia, to promote the traditional system of medicine in Russian universities and to establish a chair, according to the paper. Chandy said he would support the Russian initiative. “Our visit is basically to look into the aspects of the cost, besides if this can be possibly integrated with our system of medicine,” Kalashnikov was quoted by the paper as saying. India and Russia have already signed a memorandum of understanding (MoU) on the cooperation in the field of Ayurveda teaching, treatment and research. Over the last 15 years, Russia has made vigorous efforts to go in for Ayurveda in the country. With India’s support and assistance, Russia set up Russian-Indian Centre on Ayurvedic Research in Moscow in October 2004. Genotype-phenotype studies on Prakriti and comparison of Indian and Russian population are being presently pursued at the Centre. A permanent exhibition is also to be set up in the Russian capital for promotion and sale of Ayurvedic medicines. Indian Ayurvedic specialists have also shown keen interests in growing some medicinal herbs in Russia that cannot be cultivated in the hot climate of India. 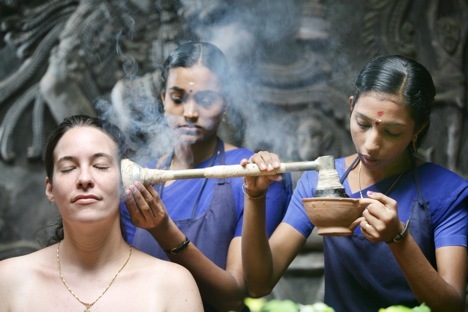 An increasing number of Russian tourists are visiting Kerala for ayurvedic treatment, which is believed to have fewer side effects than Western systems.